1) When does attorney-client privilege expire, and we’re permitted to serve materials up to patrons? For simplicity’ sake, we assume that privileged communications between attorney and client are like any other sensitive material, and can only be opened for research after all interested parties have died, our shorthand being 75 years for adults and 100 years for children. Except lawyers believe that privilege extends beyond the grave. If that’s the case, archivists of privileged collections are obligated to maintain confidentiality forever. Swidler doesn’t say some time after death, or once the lawyers themselves have died. Swidler is forever. So researchers will need permission from either the client or the donor or both, or from the legal heirs or assigns of either or both, in order to access these collections. And that chain of assigns has to extend to infinity. This combination of confidences turns the archives from a font of wisdom into a personal vault. And it’s a flagrant exploitation of archivists for lawyers to assert this kind of privilege. We accept materials in order that people, broadly, someday will be able to make sense of them; we don’t spend time and energy in the care and feeding of paper just for the archons. Right? This reappraisal served to exacerbate, rather than resolve, the sealed records problem. Unlike temporary sealed records, which may be transferred to FRCs and retained until their eventual destruction, permanent sealed case files cannot be transferred to NARA unless they include a date upon which the seal may be vacated. Id. at A.6(J). Thus, such files must remain on-site, in a virtual document purgatory, consuming valuable court storage space. 15. seven documents filed in the United States District Court for the Southern District of New York in connection with a 1963 copyright suit initiated by Dr. King (obtained from the National Archives and Records Administration). See King v. Mister Maestro, Inc.,224 F.Supp. 101 (S.D.N.Y.1963). which means first of all, when the parties sealed #15 they weren’t protecting the content of the documents, which were presumably still available at one of the NARA sites, so much as they were protecting the trail of discovery itself. Why? Apart from the fact that King’s heirs might have a superficial interest in concealing the fact that King once stooped to sue something called Mister Maestro, I have no idea. 3) Relatedly, I’ve seen photocopies gathered by lawyers from processed, open collections in my repository come back to me as “background research,” and protected work product. Why is work product in the archives at all? The field promulgates brutally short retention periods for lawyers’ records, and I’m not a lawyer, but presumably this is to ensure that a wrecking-ball-style discovery request — like David Vitter of small-town prostitute fame FOIA-ing the words “carbon tax”, re which Vitter this is big-boy school, read exemption 5 and Wikipedia “chilling effect” — comes up empty. But some recent court rulings have led lawyers to the conclusion that a die hard records retention schedule is no defense against an adverse inference. That is, if you, a lawyer, reasonably anticipate that litigation is headed your way, and you follow a scheduled destruction of records, the court will still give you the stink-eye. If an archives is available to you, the least risky path is to label all your junk “work product” — which is not discoverable — and dump it on archivists. Facilities are generally a big step up from those self-storage trailers at the edge of town. Professional staff make it their business to protect materials according to your injunctions, and to make sure nothing gets lost. Responding to discovery becomes archivists’ business, instead of paralegal temps’. Archives are an aquifer soaking up risk. 4) Who fixes the scope of the collection? Lawyers tend to assume that their email belongs to them. Doesn’t matter if it’s written during the course of their work for a university, or if it’s written during their time as a public servant. Graham Spanier requested access to his Penn State email account — not to a clone, or a backup — in order to “refresh his memory.” Andrew Cuomo likewise thinks of the archives as a first draft, subject to revision by the depositor. And if you can restrict access to photocopies of material available elsewhere, what’s to stop a party from demanding the closure of the originals? What’s to stop an institution’s counsel from identifying the risk inherent in all archives and just shutting the client’s archives down, in a frenzied dream of absolute opacity? In 2010 the Pennsylvania state archives gets six figures from NHPRC to do MPLP on 26000 cubic feet, or about 37% of its holdings. Two years later, 11000 feet had been processed, and 4000 weeded, which is basically herculean. And still barely enough to keep up with growth. By way of really offhand comparison, the much smaller state of Vermont’s records center in 2011 grew by 12,000 cubic feet to 98,000 total (PDF, page 8). In the same year, 6,000 cubic feet met retention. I think 1/3 backlog across all our collections is dramatic understatement. MPLP is barely enough to fight the bulk. Every generation of archivists promises to be the first to slay the backlog, and bulk has always won. Jenkinson was terrified by the impossible bulk of World War I records. Bulk-and-opacity in archives is not a bug, it’s a feature. Our instinctive reaction to the feature is to apply more science to where science has already failed. Take this really interesting project at Harvard last spring. Flipped, or digitization-first processing has the capacity to bring item-level (really, face-level, since we’ll be shooting verso and recto a lot) description to smallish collections. But the process presumes that the collections have been curated and all the dross weeded out already. Absent that, we’re filling our digital repository with exactly the same dejecta we filled the bricks-and-mortar one with. Yes, faceted browse will help us narrow any given group of objects, but indiscriminate processing gives us no sense that one part of a collection might be more significant than any other. Or to differentiate one collection from another. Or one repository from another. And for some users, that won’t matter and flipped processing will be hunky-dory. Let’s do an imaginary browse for all collections containing postcards. Some are from the holdings of a dedicated deltiologue. Some are from the intimate correspondence of a Maj. Gen. stationed in Haiti in the 1920s. A researcher interested in the use and dissemination of images of the tropics, or a researcher interested in the style and syntax of what’s written on postcards, would be fine; that is, non-historical research wouldn’t suffer a bit from wading through thousands of decontextualized images. Fragmented collections, shorn of context, are fit for disciplines which see intrinsic attributes in objects. It’s a piece of text, like the Gettysburg Address, or the Declaration of Independence, or the Letter from Birmingham Jail, which has iconic power. And it’s a wild outlier. Of the tens of millions of pages in the tens of thousands of unprocessed feet at any given repository, a vanishingly small number will have that kind of significance. For everything else, someone will have to guide researchers to the significances of the archival corpus. When you don’t know what you’re looking at, that’s where history steps in. History lives on third-person-omniscient perspective. Creators and donors virtually never understand what their collections might mean. Even the best researchers only have a parochial, or a third-person-limited perspective, seeing archival collections through the lens of their prior publications. I recently worked on a collection of photographs from Iran of the 1910s. The creator had been interested in economic development and ethnography. The donor was interested in family history and evangelism. What I found were 1″ x 1-1/2″ photographs of executions and war crimes, taken during what I at first assumed was the Persian campaign in World War I. After reading diaries, and finding captions for other similar photographs, and checking the period of time the creator was in-country, it became much more likely that these were images of royalist retribution against supporters of the new Iranian Majlis during the revolution of 1906-1911. This half-a-foot collection took about three hours to get its world-historical significance unspooled. Creating meaning from archives demands context. Access can be delivered en masse. Context can’t. Access without context makes for opaque bulk. Processing cuts bulk into something legible. Digitize-first is an interesting adjunct to processing, but the idea that we can slap search on top of an undigested bolus of images and walk away and users will pick up the pieces is motherfucking hilarious. Advocacy for archives under threat — from funding cutbacks, hurricanes, public apathy, copyright holders, lawyers generally — assumes a faith that archives are alive. That they ingest material and output products. If you’re not a fan of state government, you think of your archives, when you think of it, as a parasite or virus, siphoning resources in order to replicate its own RNA and release more archivists into the world. Archives are at the cusp of life. Our traffic in them is rooting down the dead. In part, archivists perpetuate a dead science — office management. The bulk of the collections in any major institutional archives, whether in a university, governmental body, religious organization, or corporation were formed in the 20th century by secretaries, clerks and administrative assistants. Women (and some men) who identified correspondence as “personal,” “personal and confidential,” and so on. Women (and some men) who created files on topics of interest, and arranged them alphabetically. And who, when correspondence was antedated, or when topics were no longer of interest, sent folders downstairs to the “dead files,” or the “morgue.” And when photographs, or films or papers became entirely useless to the institution, they were sent to the archives, their final resting place. A dead science, and a systematic management of death. What terrifies us about genealogy — meaning ancestor-hunting, not anything Foucauldian — and which we only express in a kind of sub rosa annoyance and impatience with genealogists, is necrophilia. Sub rosa, because no archivist would admit that our job is to seal off the dead from the living, offering ever-more precise and authoritative descriptions, surrogates, and virtual encounters in an attempt to buy off the grave-robbers. Our unacknowledged work is to keep the dead dead. Genealogists dig and scrabble and scrape. They pile up mounds of names, divorced from context, linked and relinked and posted and reposted, xeroxed and faxed and carboned and retyped. Against all archivists’ work to carry the orderly dead into the orderly future, the genie roots out a pinky knuckle and ferrets it away to barter with someone who has a big toe. The dead, whom we had brought together in heavenly array like in a Byzantine altarpiece, are picked over and their parts are Frankensteined into ghoulish masses of uncouth semi-knowledge. 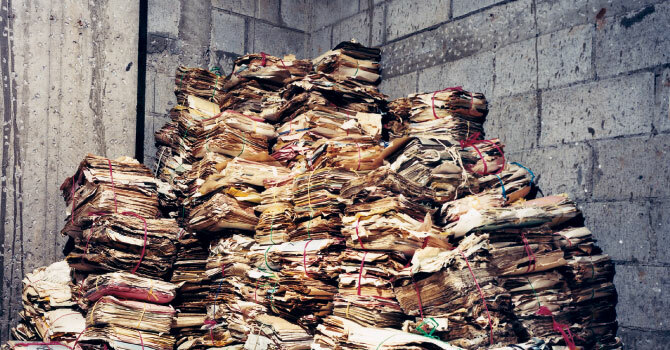 The assumption that community- or participatory- or social archives amount to a tyranny of disorder, or that minimal description or mass digitization or the digital, period, undermines our capacity to preserve materials’ historical context is haunted by taboo and superstition, and, left unexamined, will surreptitiously undermine all our noble declarations of institutional glasnost.